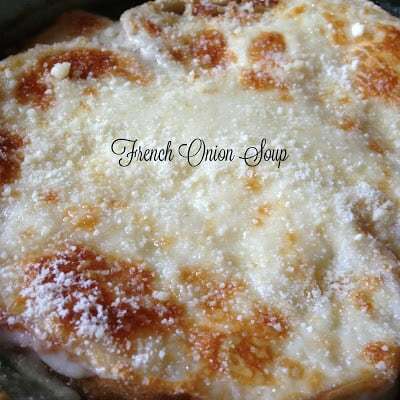 There are three secrets to making delicious French Onion Soup…the first is long, slow cooking to develop the onion and garlic flavors. 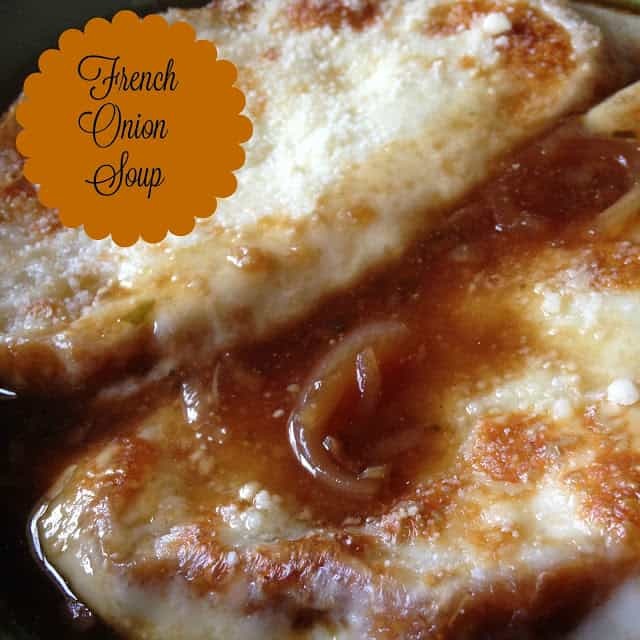 The second is to use French bread with a sturdy crust, so that the slices of bread stay intact as they float on top of the soup and the third, use home-made beef broth for the base of your French Onion Soup for the most robust flavor. Making your own beef stock isn’t as difficult or as scary as one might think. All you really need is some meaty beef bones which you can obtain at your local butcher shop, in the meat section of most grocery stores or simply save your own beef bones, freeze them until you have enough to make stock. Second you’ll need some water and lastly carrots, onions, celery and spices, to flavor your stock. 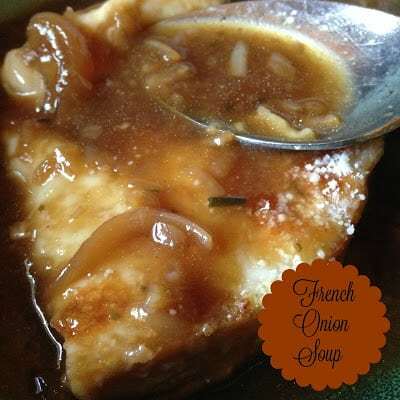 If you would like to make French Onion Soup with a more earthy, meaty, rustic taste you can substitute Venison Stock in place of the beef stock in this recipe. My hubby likes his French onion soup made with the venison stock vs the beef stock for that reason. Beef, venison, chicken, and turkey stock are basically made the same way. This summer save your ice cream pails so when winter rolls around again, you can make and freeze stock. Kitchen Tip: Stock up on cheesecloth when it goes on sale at large, discount stores (Target/Walmart) or pick it up at your local Dollar Tree. I love the Dollar Tree for stuff like that..you can find some of the handiest little gadgets at the Dollar Tree! In a large nonstick saucepan, heat butter and oil over moderately high heat. Add onions and garlic. Lower the heat to low and cook for 30 minutes or until onions are very soft and golden brown, stirring often. Add the broth, wine, Worcestershire sauce, salt and pepper. Bring to a boil. Lower the heat and simmer, covered, for 20 minutes. Meanwhile, preheat broiler. Arrange bread on a baking sheet. Broil 4 inches from heat for 30 to 60 seconds or until toasted. Top each bread slice with a half slice of cheese. Broil for 1 minute more or until cheese melts. Ladle soup into bowls; float bread on top of soup. Serve immediately. 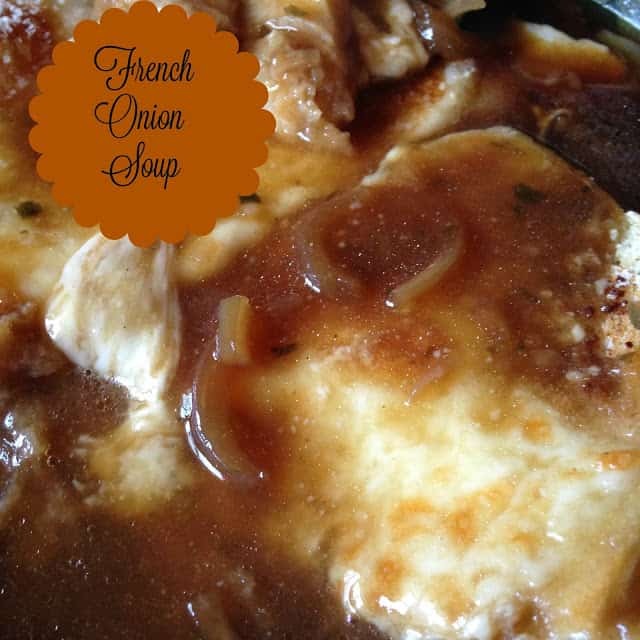 Hi Lynn, Thanks so much for sharing your delicious French Onion Soup recipe with Foodie Friends Friday this weekend. Will pin/share. Happy Thanksgiving! and we look forward to seeing you again soon.